I'm in Florida and I've been stitching a little bit. 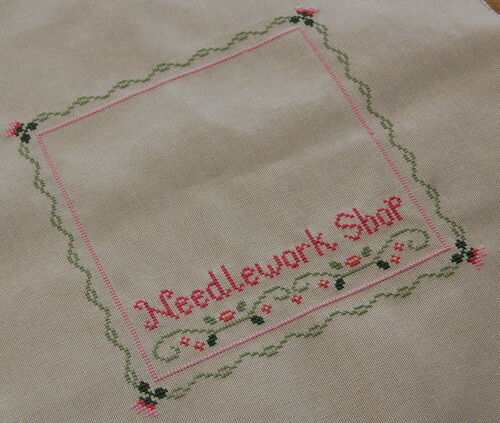 Here's my latest progress on "Needlework Shop." And here's my latest progress on "LH Neighborhood." Wow! You are making great progress on both pieces! I received my Needlework Shop in the mail today! I worked a little on my neighborhood over the weekend, but haven't taken a picture of it. I'll probably do that tonight, and post it tomorrow. Oh help I can see I'm going to be stashing a bit more! Both of these pieces look fantastic so far Nicole. I just love the colours in the Needlework Shop. You stitch such pretty pieces. They always look really bright and cheerful :o) Always a pleasure visiting you here in blogland. Wow you make the greatest progress in stitching and as always everything is so beautiful!! How long are you going to be in Florida? I have been working steady learning to stitch in hand with the sewing method and am getting on to it. I wish mine looked as good as your stitching does. I guess it just takes lots of practice and I am doing on 40 ct which is quite the learning experience. 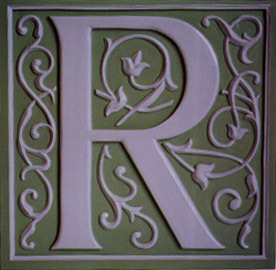 Your projects here are gorgeous! They are both gorgeous and you're doing amazing work! As always, your work is spotless.. the "immaculate execution." Hee! Great progress on both projects. Looks great! Wow, your progress leaves me breathless. Way to go, girlfriend. Hope you're having a great time there in the land of sunshine and oranges! 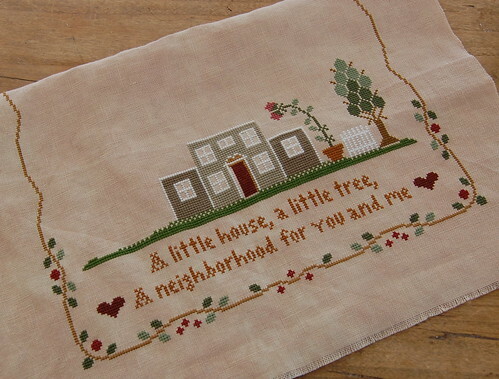 You make the great progress in stitching I like this Needlework Shop, nice colors. Both projects look great Nicole. Can I join you in Florida? Great progress Nicole! You know I love these designs so much:) Please take a moment and have a look at my blog, there's a surprise for you. Well done on both wips. So are going with DMC only for your Little House Neighborhood? You have been awarded the Brillante Award - please visit my blog! Wow! Both of them look amazing! Am I able to join your Neighbourhood SAL? Hopefully my fabric and chart will arrive in the mail soon. Just gorgeous, Nicole! I always love to see your work. I have admired your stitching and your blog for quite some time now. I've nominated you for a Kreativ Blogger award for your inspiration to me! Details are on my blog. Your progress is always truly amazing! I usually don't like LHN or CCN but you seem to have captured the colours wonderfully on the fabrics you've choen. I often find stitchers are doing these pieces on very dark or very light fabircs not allowing the colours to POP! hi hope florida is going well check out my blog for a suprise!